Players can take control of the Symphony of the Night hero when the DLC launches on March 25. While Castlevania: Lords of Shadow 2 may have been getting some mixed reviews as of late, longtime fans of the series will have some extra incentive to play the game later this month. On March 25, the first DLC for Lords of Shadow 2 drops, and it features the return of fan-favorite character and pallindrome enthusiast Alucard. Alucard, the son of Dracula, first showed up in Castlevania III on the NES, but most fans probably remember him best as the protagonist in the PS1 classic Castlevania: Symphony of the Night. In the Lords of Shadow 2 DLC, titled Revelations, players will take control of Alucard who can turn into a bat and a wolf in addition to other unique "Glaciem" and "Igneas" abilities. 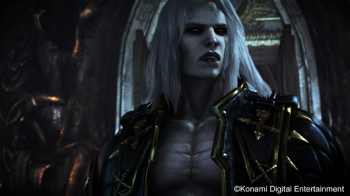 The DLC is set before the events of Lords of Shadow 2 and is supposed to examine the relationship between Alucard and his father. No price has yet been given for the DLC, but it has been confirmed to release on the Xbox 360, PS3 and PC versions of the game. Lords of Shadow 2 launched in late February. Since then, developer Mercury Steam has been in the news for taking game reviewers to task for what it feels are unfair scores. Our own review was none too flattering, giving the game a two out of five. While not all were sold on Lords of Shadow 2, I'm certain some fans are eager for the reappearance of Alucard. What do you think? Will his return make you more likely to pick up the latest Castlevania game?